Now that we've learned what traits, keywords, and values that define cards in the Battle for Sularia, and most importantly what all that text means, it's time to become more familiar with the weapons at your disposal; and how to use them! The main four card types: Tactics, Conditions, Sites, and Combatants, are the means to outmanning, outwitting, and outgunning your adversaries in the battle to reduce their life points to zero! First up are tactics and conditions. But hey, what gives? You said these were two different card types, so why are they grouped together? Excellent question, and the answer is a simple one. Tactics and conditions are so similar that they can be considered to be grouped together into a single consolidated super-group. Both require threshold in their cost, may generate sularium (upper right-hand corner blue icon, and both lack attack or defensive values. Furthermore, each has an effect that triggers and is used as a one-off, lasts until end of turn, or persists while the card is face-up. Which brings us to their final and probably most significant similarity, because it may have very real implications on the outcome of the game. 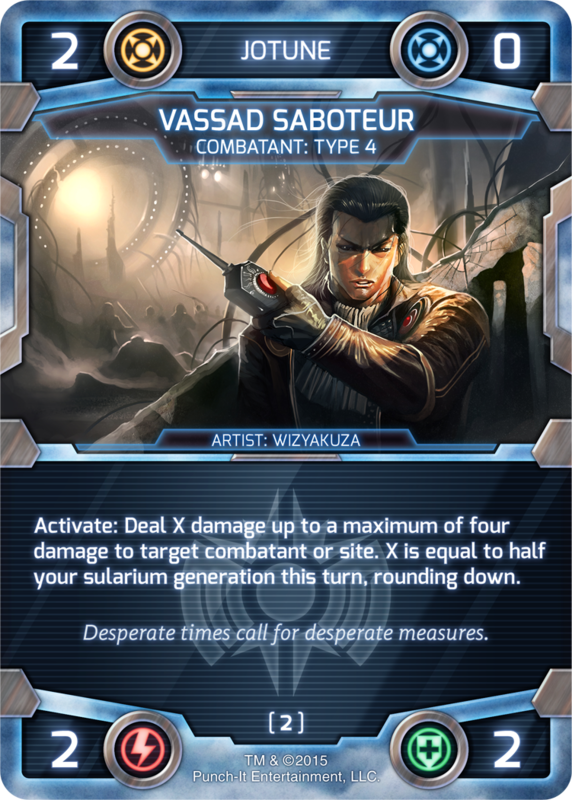 Each turn you may take a card from your hand and place it into your influence row, effectively "leveling up" your status as a battle commander and gaining more influence to perform ever increasingly complex and demanding tactical feats. We'll dive into the influence row, along with the other play zones, in more detail next week, but know now that as your influence row grows card-by-card, so does your influence threshold (or threshold for short) and your influence generation. Threshold requirements are denoted by the green cost in the upper left-hand corner of a tactic or condition card. Once you reach threshold 1, or 2, or 3, by having that many cards in your influence row, you may play any number of tactics/conditions that are equal that number or are less when you have priority. Yes, threshold is a "resource" that does not deplete since it simply asks that you have leveled up your influence row to a certain number of cards. Like I said, we'll get back to exactly how all that works soon, but the important distinction is that when you place a tactic or condition card into the influence row to gain more influence, and that card is later played from the row - it stays there and continues to give you influence! A site or combatant once played from the influence row (because any card can be placed there face-down) will leave the influence row to be placed in the site zone or combatant zone respectively, effectively reducing your influence by 1 for each site or combatant card played this way. This means that tactics and conditions are the best cards to play into your influence row, to build your threshold and generate influence! If this isn't 100% clear, our upcoming battlefield tutorial will fully outline how the influence row works, along with threshold, influence generation, and all the play zones, so stay tuned next week! One final note about tactics and conditions, and this time it concerns a difference that they share: tactics are "one use" cards that once played from your hand or the influence row (which functions effectively as a second hand) generate an effect and then cease to function. Conditions when played from the hand or influence row generate an effect for as long as they are revealed and in play. Tactics = one use, conditions = continuous effect. Simple as that! Sites: require influence to play and generate sularium. Next are sites. In the Battle for Sularia, there are currently two resources: influence and sularium. We just went over how having a certain threshold of influence (threshold for short) allows us to play tactics and conditions, now let's see how we use influence to play sites. Each turn you are able to place up to one card from your hand into your influence row. Each card in that row generates one influence point, which is added to an "influence pool." (Example: you have five cards in your influence row on turn five, you generate five points of influence and have a threshold of five). Unlike threshold, the influence generated each turn is spent from its pool and can be exhausted. (Ex. you have five influence points in your influence pool and spend four points to play a Storm Citadel from your hand, you now have one influence point remaining, but still have a threshold of five). The influence cost of a site is denoted by the number in the top left of the card next to the purple influence symbol. The basic function of sites is to act as defensible positions, mine sularium, and bolster your forces with the development of special abilities. Foremost, you need sularium to muster a strong force of combatants, and though there are means of gaining sularium other ways, most often you will be getting the bulk of this precious resource from your sites, as denoted by the generation value in each site's upper right-hand corner. Note that each site has an attack and defense value as well. Yes, a site can defend itself (though having a helping hand from your combatants would be nice)! When attacked, and the defense value of a site is met, and it is destroyed and placed into your damage pile, but before it does, it will have the opportunity to strike back at its attackers and hopefully dispatch one or two! (Think of it as the automated defenses or garrisons stationed there defending from the walls). As an added bonus, when you control at least one site, your opponent's combatants must attack it instead of you, but if you don't, they can attack you directly. So build up your sites and get those defenses online! Having a healthy domain of sites is essential to mining sularium and protecting yourself, but they also confer special bonuses in the form of stat pumps and keyword special abilities. Once you have established, say, a Cloud Stronghold, you'll have access to giving your combatants the ability to strike first in combat! Sites aren't simply sularium generation facilities, they're R&D and training centers too! Combatants: the backbone of any strong fighting force. Last of the four main card types are combatants. Now that we know influence allows us to play sites, and those sites generate sularium, what are we going to use all that sularium on? Combatants! Combatants are the work horses of a faction's fighting force. Sometimes tactics, conditions, and sites are used to dispense damage, but more often than not, its the men, women, robots, and monstrosities of sularia that end up doing the heavy lifting in battle. You'll note that the yellow sularium cost icon in the upper left-hand corner of a combatant card is the same as the blue sularium generation icon. This is by design, as both denote the resource sularium. Now that we've established our sites for the turn, we're going to generate sularium by adding up all the numbers in the right-hand portion of our cards and use that sularium to deploy combatants! Sularium is placed in a "sularium pool" and is depleted like influence, so you only get as much to spend each round as you generate. Like sites, combatants have an attack and defense value; and also like sites, once their defense value is met, they die. It's a tough world out there, and your forces are bound to suffer casualties, so fear not! Some combatants are pretty straight-forward and are most effectively used as attackers and defenders, and then there are those with very potent abilities that can deal damage directly, manipulate your opponents' forces, and give beneficial boosts to your own! The strategy for how you build your force of combatants is ever changing as more and more enter the Battle for Sularia, and each new product release brings even more exciting opportunities! To give you an idea of what you get for your payment of sularium when deploying a combatant, check out the "curve" of combatants below. Typically one sularium buys you a point of attack and defense value and sometimes you get a little more value in keyword abilities. All the combatants below have Flight, which means they can only be defended by other fliers or by Specialists, and can fly over enemy lines to attack weaker rear site positions! A curve of Jotune combatants. That's the basics of our four main card types. Be sure to check back with us next week as we go over where your forces do battle and how a turn works!